If you enjoy shooting paper targets, you’re well aware of what a nuisance it becomes trying to figure out where you hit each time. 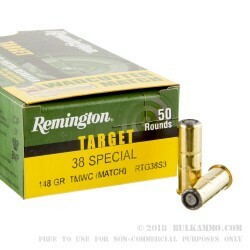 This 38 Special cartridge by Remington Arms presents the perfect solution to that problem with its 148 grain lead wadcutter bullet. The projectile’s flat, broad head punches a big circle through the target with each hit, eliminating the need to strain your eyes looking for the point of impact. 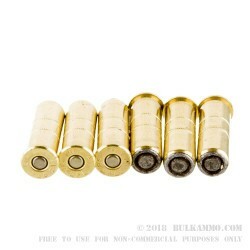 Wadcutter bullets are also suitable for self-defense, as that bullet will make a wide hole in more than just paper, although this round is specifically designed with competitive paper target shooting in mind. 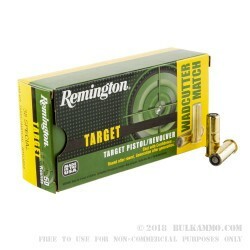 Remington’s ammunition has a fine reputation for consistency, reliability, and accuracy, and this round is certain to service your wheel gun well. 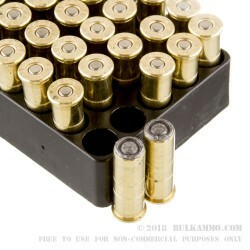 The cartridge’s non-corrosive Boxer primed brass casing is also just the ticket for handloading.